Call to Schedule an Appointment (845) 827-1125. The summer is a fun time after the hustle and bustle of the school year. Vacations are planned and kids are playing outside from sunrise to sunset. But, don’t forget the dentist. County Dental cares for the well-being of our patients and New York residents. Here are some daily dental hygiene tips County Dental recommends to protect your mouth and overall health tips while having fun this summer. Remember to continue the routine of brushing twice a day and flossing daily. It is recommended to remind children over the summer to maintain a consistent brushing and flossing routine. Between activities, camps and vacations kids may forget about this important oral health responsibility. County Dental recommends replacing your toothbrush at the beginning of summer and have extras on hand, especially when on vacation. Drink eight to 11 glasses of water a day. Drink more water if you are spending more time outside to maintain proper hydration. Get your daily family workout completed by not calling it a workout, but family game time. Continue to get the recommended amount of sleep per night. Don’t wait until the rush in August when school is near for a dental checkup. Schedule an appointment with County Dental this month to start the summer and upcoming school year on a healthy note. Make sure your kids follow pool rules. 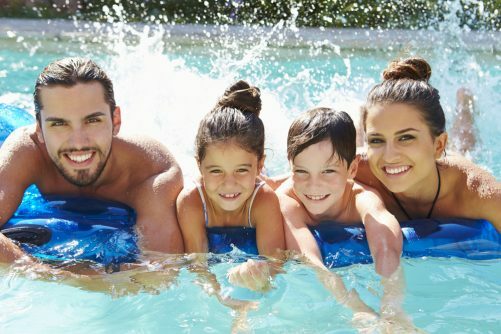 Running on slippery pool decks, diving into shallow waters or bumping the pool ledge with their mouth causes many children to either chip or knock a tooth loose. Pack an emergency dental care kit to take along for vacation. Essentials for this kit, according to the Academy of General Dentistry, are a handkerchief, gauze, a small container with a lid, ibuprofen and your dentist’s contact information. Summer can really throw your routine for a loop. But by following these oral health tips for summer, your kids can start the school year with prepared and with a healthy smile. Schedule an appointment today.